Villa Pablo is one half of the Picasso Villas complex (it shares the estate with a sister property, Villa Paloma). Situated close to Bang Tao Beach, the complex looks out to a lush tropical landscape, and enjoys a restful, tranquil environment. 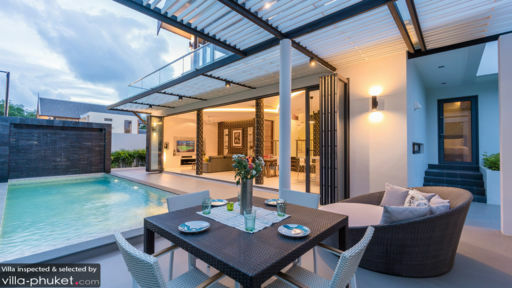 Designed by a local celebrity, Villa Pablo features a stylish, modern decor. 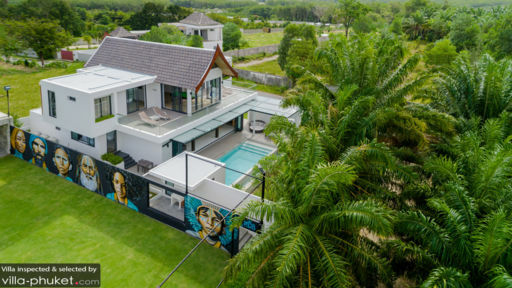 The home will strike a chord with football enthusiasts, thanks to its collection of football memorabilia - from rare photographs, to a set of dining chairs upholstered with signed player shirts by the likes of Pele, Beckham and Maradona. Featuring five beautifully appointed bedrooms and bright, airy communal spaces, Villa Pablo is ideally kitted out for travelling parties of ten. Five bedrooms are spread out across the villa. Both guest bedrooms are located on the ground floor; each is equipped with twin singles, an IPTV entertainment system and en suite. The master suites, set on the upper floors feature king beds, en suites with bathtubs, IPTV entertainment systems, a collection of Picasso prints and access to private sun terraces. A fifth bedroom, equipped with double bed and an en suite may accommodate two guests. This fifth bedroom has an external access from the main villa. A turquoise pool takes centerstage outdoors. On one end of the pool lies a sun-dappled terrace; outfitted with a daybed, al fresco dining set and barbecue deck, it’s where guests often congregate in the evenings for poolside dinner parties. The complex also features a private, FIFA approved mini-football 5-a-side pitch complete with floodlights. Professional coaching and training may be arranged for football enthusiasts. The 18m x 38m space also doubles up as a spacious venue for weddings, birthday celebrations and team building events. Lofty, vaulted ceilings and bi-folding glass doors combine to create sunlit interiors that feel airy and inviting. The open plan living area looks out to the pool, and features an indoor lounge, dining area and kitchen. The latter is equipped for in-villa cooking lessons and private dining experiences. Ascend up the stairs to a light-filled entertainment room with a billiard table and views out to the forested hills. Villa Pablo is a full-service vacation rental. The on-site team will readily assist with tour and travel arrangements. 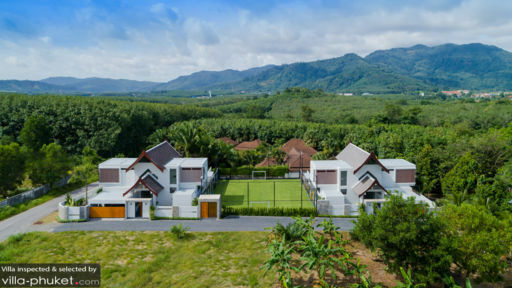 Villa Pablo is located along the western coasts of Phuket, about 10 minutes’ ride from Bang Tao Beach. The laidback, relaxed environment will appeal to family vacationers looking to stay away from the tourist hotspots on the island. When you’re not enjoying an in-villa dining experience, take your pick from nearby restaurants like DeDos (for French cuisine with Asian influences), Black Cat (a beautiful bamboo-themed venue with Mediterranean and Thai fare) or Cut Grill & Lounge (the waterfront restaurant boasts uninterrupted sunset views and some of the best steaks on the island). Unwind with a nightcap at the lounge bar at Cut, or head over to Siam Supper Club to soak up its New York-style bistro vibes and live jazz performances. If you’re looking to spend a relaxed day in town, check out Anthem Wake Park (for wakeboarding), Laguna Phuket Golf Club, Phuket International Riding Club and Wat Cherng Talay. We’d also recommend spa rituals at Banyan Tree Spa Sanctuary or Angsana Spa Laguna - both of which are venues that feature top of the line treatments and service. Further away from your villa are attractions like Khao Rang Viewpoint, Big Buddha, Wat Chalong, Sirinat National Park and Bang Pae Waterfall. The staff at Villa Pablo will readily assist with your travel arrangements - from renting a car to planning your itinerary. So don’t hesitate to reach out if you need help!